Abstract: Several hexavalent chromium standards in soil, certified in the past decade, either have high concentrations of chromium or active matrices that render them unsuitable for validation studies that use natural soil untouched by industrial activity. NIST 2701, for example, is made of chromium processing ore residue (COPR) industrial waste material from New Jersey. It contains approximately four percent total chromium, with an unnaturally high Cr(VI) fraction (552.1 mg/kg). SRM-2701 also includes an active matrix that dominates the chemistry of the standard and causes significant Cr(III)/Cr(VI) species shift and biases during extraction. Presently, no low-background level standard containing an inert matrix is available for the appropriate validation of low level Cr(VI) in native or uncontaminated soil. 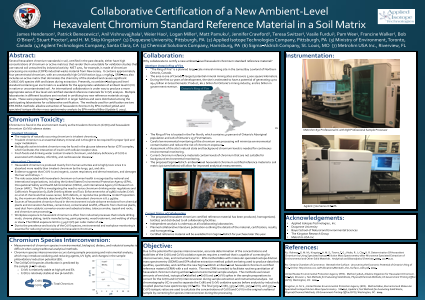 An international collaboration is under way to produce a more appropriate series of low level soil certified standard reference materials for Cr(VI) analysis. Multiple laboratories in different locations are involved in certifying two new reference materials at ng/g levels. These were prepared by Sigma-Aldrich in larger batches and were distributed among the participating laboratories for collaborative certification. The methods used for certification are two EPA RCRA methods: alkaline extraction by EPA method 3060A and speciated isotope dilution mass spectrometry by EPA method 6800 (Update V, 2015). The methods used in the preparation of the materials and preliminary certification, discussion of the Eh and Ph phase diagram stability of the material, and current status of the project will be presented. Summary: Collaborative Certification of a New Ambient-Level Hexavalent Chromium Standard Reference Material in a Soil MatrixReferences: Rahman, G. M. M.; Kingston, H. M. S.; Towns, T. G.; Vitale, R. J.; Clay, K. R. Determination Of Hexavalent Chromium by Using Speciated Isotope-Dilution Mass Spectrometry after Microwave Speciated Extraction of Environmental and Other Solid Materials. Analytical and Bioanalytical Chemistry. 2005, 1111–1120. Ontario Chamber of Commerce. Beneath the Surface: Uncovering the Economic Potential of Ontario’s Ring of Fire. Online: http://www.occ.ca/Publications/Beneath_the_Surface_web.pdf. 2014. United States Environmental Protection Agency (EPA). Method 3060A, Alkaline Digestion for Hexavalent Chromium. SW-846, Revision 1, Test Methods for Evaluating Solid Waste, Physical/Chemical Methods; US Government Printing Office (GPO), Washington, DC. 2014.